GALION — Galion High School’s wrestling program is looking at returning leadership and continued growth this season. They will be doing so under the familiar leadership of head coach Brent Tyrrell, who is entering his 19th season with the Galion wrestling program, including that last 10 as the head coach. Galion lost just two contributing seniors from last season’s squad that went 1-7 overall and 0-3 in Mid-Ohio Athletic Conference competition. Mason Weldon and Tyler Goodrich both earned their diplomas in the spring of 2018, leaving voids, especially in Weldon’s heavyweight class as he was a state qualifier and one of the top wrestlers for the Tigers the past few seasons. He won the 285-pound weight class in the MOAC championships last season.. However, Tyrrell remains confident in his core returning squad. Back on the mats for Galion this season will be Brenden Ganshorn, Noah Grochowalski, Devin McCarthy, Ian Lehman, Mitchell Cotter, Michael Marks and Max Fisher. A season ago, the Tigers saw Ganshorn finish as the runner-up in the 120-pound weight class and also got a runner-up finish from Grochowalski in the 182-pound class. Galion also got fourth place finishes from Lehman (132) and Fisher (160) during last season’s trek. In addition, McCarthy wrestled his way to districts last season while seniors Ganshorn and Grochowalski have earned two district berths throughout their careers with the Tigers. Also joining the Tigers this season will be Ty Spencer, who moved into the district from Ontario and is a returning state tournament alternate and a league runner-up last season in the 113-pound weight class. The MOAC, which has been dominated by the River Valley Vikings since the 2013-2014 season (5-time team champions), will likely be the favorite again come conference tourney time, but Tyrrell speaks highly of his squad’s chances. 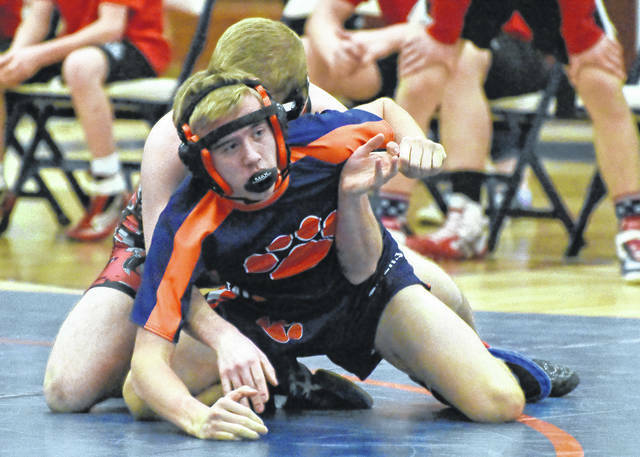 The season has already geared up for the Galion Tigers with multiple scrimmages and regular season action is set to officially begin on Saturday, Dec. 1 when the orange and blue hit the road to compete in the Findlay Duals. On Thursday, Dec. 6, Galion will play host to Hillard Darby and Pleasant in their only regular season home match. The next time the Tigers will be on their home mats will be on Saturday, Feb. 16 when they host the other seven schools in the MOAC Championships. 126 pounds. McCarthy (G) vs. Bloomfield (B). The Tigers hosted the Redmen wrestlers Wednesday afternoon, Jan. 17, 2018. Bucyrus won 39-35 on a pin in the final match. https://www.galioninquirer.com/wp-content/uploads/sites/38/2018/11/web1_z-011718j-BHS-at-GHS-wrestling_0106.jpg126 pounds. McCarthy (G) vs. Bloomfield (B). The Tigers hosted the Redmen wrestlers Wednesday afternoon, Jan. 17, 2018. Bucyrus won 39-35 on a pin in the final match. 120 pounds. Ganshorn (G) vs. Ricker (B). The Tigers hosted the Redmen wrestlers Wednesday afternoon, Jan. 17, 2018. Bucyrus won 39-35 on a pin in the final match. https://www.galioninquirer.com/wp-content/uploads/sites/38/2018/11/web1_z-011718j-BHS-at-GHS-wrestling_0084.jpg120 pounds. Ganshorn (G) vs. Ricker (B). The Tigers hosted the Redmen wrestlers Wednesday afternoon, Jan. 17, 2018. Bucyrus won 39-35 on a pin in the final match.